People are often curious about professional horticulture in an urban setting. After announcing the title of Rosarian at the Brooklyn Botanic Garden, they scratch their heads and ask "...well what do you do all day?" A volunteer working in the Cranford Rose Garden at peak bloom. Those who work desk jobs often romanticize working at a botanic garden. They imagine straw hats, tan arms, and earthy smiles putzing around the garden smelling roses and poeticizing about bees. In actuality, it's a lot of hard manual labor peppered with few moments of divine communion with nature. Highly cultivated nature. The last week in the Cranford Rose Collection has been a bit contrary to the sweaty, heat-induced cloud of consciousness that characterizes gardening in the summer months. Mornings lately have been unseasonably cool and I've unashamedly spent at least an hour each day watching insects feed on companion plants to the roses. Baldfaced hornet feeding on fennel. These companion plants are intentionally dispersed throughout the Cranford to break the rosaceous monoculture and increase insect diversity. Fennel's protein-rich pollen and carbohydrate-laden nectar satisfies the needs of insects but also presents a whole array of flavors in the culinary world including citrus and licorice. I've watched it hypnotize bees, wasps, spiders, and ants as the ever-reaching plant offers its umbelliferous blooms to the sky. 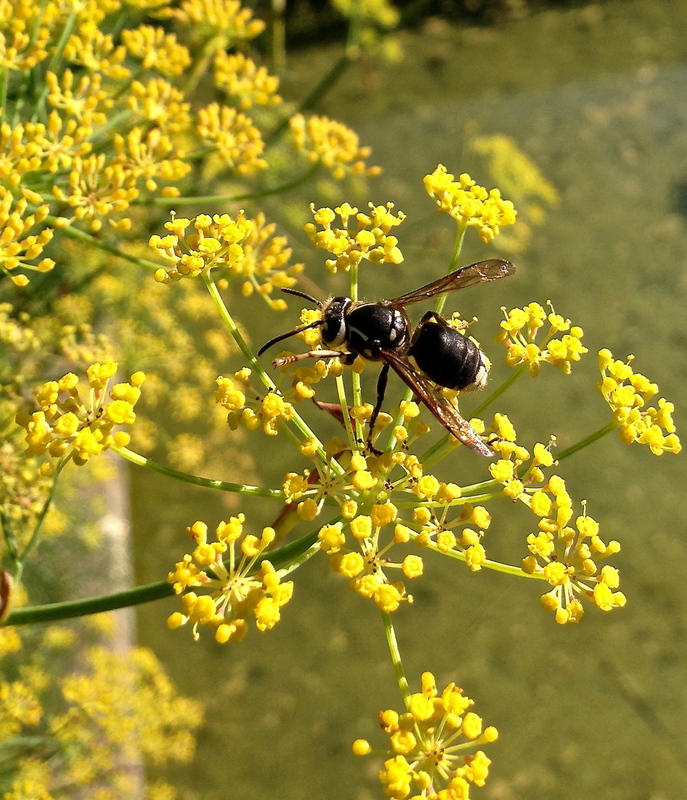 Even the aggressive cicada killer wasps that stalk anything nearby are so entranced by fennel's magic that they barely notice you're near their ground nest, conveniently burrowed underfoot. Black swallowtail butterfly catepillar feeding on fennel foliage. So what does this have to do with bread? Along with a little organic lemon zest, I have meticulously harvested some fennel pollen to lace into a loaf made with rye, spelt, semolina, and bread flour. The result is a chewy, aromatic, and tangy canvas for all kinds of goodies: fish would be an obvious selection but also garlicky hummus or seasonal jams would accompany this bread quite well. You can rest well knowing you don't have to be an insect to feast on fennel's deliciousness. Loaves inspired by the fanciful butterfly!